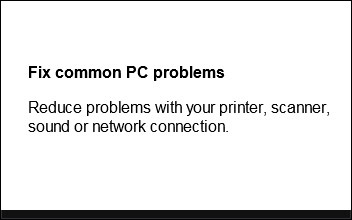 Reduce problems with your printer, scanner, sound or network connection. I remembered AVG had been doing a promotion lately regarding helping with other software even if it wasn't their own. I knew my computer hadn't been acting weird nor had I been to any fishy websites, so I didn't suspect a virus. I did "CTRL+Alt+Delete" and went to the "Applications" tab, where AVG normally is not located unless it's running a process that shows up on the screen. Sure enough, it was there. Also with it was a browser window with the name "Fix common PC problems." This is why I don't recommend AVG to friends and family any more. They have too many pop-ups trying to sell things. I recommend either BitDefender, Avira or Avast. I don't mind the manual updating and that would be a great place for offers. Not pop-up's that you can't close out like this one or ones that over lay all of your other windows. They're minor annoyances, but they occur far too regular. Hosted by HostNine This page was created in 0.00399303436279 seconds.